This in one of my two, favorite healthy salads I routinely buy at M Café from the LA Times Food Section. The other is their Kale Salad. Both store well in the fridge for up to five days. They’re both SOooo yummy and healthy for you! 1. Heat the oven to 350 degrees. Place the cashews on a baking sheet and roast for 5 minutes. 2. While the cashews are roasting, in a medium bowl, combine the maple syrup, curry powder and salt. 3. Toss the cashews with the spiced maple syrup, then spread again on the baking sheet. 4. Roast the cashews for 15 more minutes, tossing every 5 minutes, until toasted and aromatic. Remove from heat and cool well. This makes more cashews than are needed for the remainder of the recipe; the cashews can be stored at room temperature in an airtight container. 2. In a large bowl, whisk together the olive oil, curry powder, salt, cumin, coriander, mustard and ginger. Add the cauliflower florets and toss to combine and evenly coat. 3. Spread the florets in a single layer on a baking sheet and roast until golden-brown and aromatic, about 20 minutes, tossing every few minutes for even cooking. Remove from heat and cool completely. 1. In a small bowl, whisk together the agave syrup, lemon juice and olive oil to form a finishing syrup. Set aside. 2. 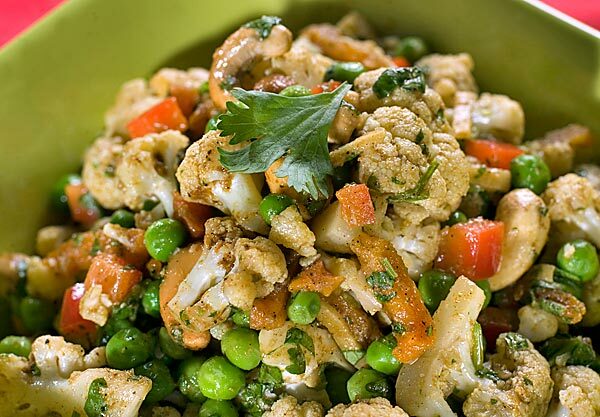 In a large bowl, toss together the cauliflower, peas, bell pepper and apricot. Pour over half of the finishing syrup and toss to combine. Stir in the cashews, cilantro and salt. Taste, adding additional finishing syrup if desired and adjusting the seasoning as needed. Cover and refrigerate a couple of hours to give the flavors time to marry before serving. This makes about 8 cups salad.